Written from the perspective of a reflective technoetic art practitioner, this thesis investigates the aesthetics of digital information environments and its influence on mediated consciousness. It describes interactive processes among user, information and interface; proposes a closer look at representational paradigms of space-time; suggests potentially illuminating parallels with complex adaptive systems; and explores their theoretical and practical co-implications. This thesis traces the evolution of interactive art practices from Marcel Duchamp and Andy Warhol to Roy Ascott’s technoetic art framework and deploys Nelson Goodman’s aesthetics to conceptually bridge practice and theory. It focuses on the interactive hybrid art installation “Mixing Realities” as an illustrative contemporary example, analyzing its physical and digital components, aesthetic and conceptual goals, and reception by various users. It interrogates the work’s interactive potential for expanding consciousness and creating new knowledge, as well as the conceptual limitations of current-traditional physical narratives that emphasize embodiment to represent the architecture of digital information environments and the user-interface relationship. Parallels between industrial and digital revolutions contextualize the problem of existing representational paradigms. As products of the mechanical age, physical narratives rely on linear visualization and episodic memory, restricting digital information’s potential and preventing more balanced integration among user-information-interface. This triadic relationship is identified as “meta-environment,” taking into consideration its different elements and characteristics, as well as overall interactive relationships. 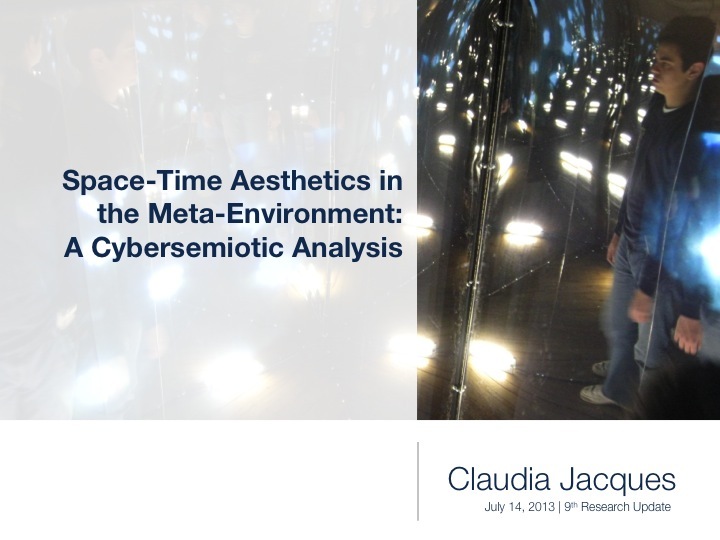 Methodically, this thesis observes that current frameworks of cybernetics, semiotics, information theory, and digital media impede integration of user, information and interface in a manner that accords them equal weight and acknowledges their mutual influence on one another. The current understanding is that information is either a human perception (semiotics) or computer interface process (cybernetics, information design, digital media). This creates a gap in the user, information, interface relationship. Adequate analysis of the meta-environment requires an integrative theory. Søren Brier’s Cybersemiotics offers a framework that integrates feedback processes and phenomenological perceptions, enabling study of the meta-environment with a focus on how individual elements influence one another in a dynamic triadic relationship. Visual representations of this analysis suggest that each element in the meta-environment at some point works as mediator of the interactive process. As technoetic art calls for the expansion of art practices to telematic, digital, genetic, vegetal, moist or linguistic interactions, the possibility of understanding these interactions as triadic dynamic complex adaptive systems creates the potential of expanding how humans interact, perceive space and time, and develop group consciousness.